Piero Tani, Flows, Funds, and Sectorial Interdependence in the Theory of Production. Robert Boyer and Pascal Petit, The Cumulative Growth Model Revisited. Marcelo de Paiva Abreu, On the Memory of Bankers: Brazilian Foreign Debt, 1824-1943. 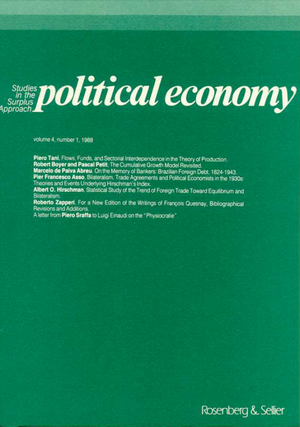 Pier Francesco Asso, Bilateralism, Trade Agreements and Political Economists in the 1930s. Theories and Events Underlying Hirschman’s Index. Albert O. Hirschman, Statistical Study of the Trend of Foreign Trade Toward Equilibrium and Bilateralism. Roberto Zapperi, For a New Edition of the Writings of François Quesnay, Bibliographical Revisions and Additions. A letter from Piero Sraffa to Luigi Einaudi on the “Physiocratie”.